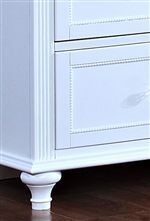 This tall dresser mirror is framed with select veneers over hardwood solids in a white finish to create a feminine accent in your child's bedroom. 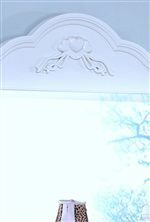 Intricate details on the mirror are heart shaped appliques and a scalloped top edge to complete a fun, adorable design. The Megan Casual Framed Vertical Mirror by New Classic at Casa Leaders Inc. in the Wilmington, Long Beach, Torrance, Lakewood, Los Angeles area. Product availability may vary. Contact us for the most current availability on this product.